A popular nightclub, always full of people and the in place to be. Upstairs is sound proof apartments. Where Ritsu Kaname and Haruki Sugimoto live. Ritsu sighs as his sister forced him to come downstairs to the cub, even more frustrating that he up and left him by the bar. He sits up at a bar stool by himself and sips on an alcoholic drink. The music was loud against his ears as people bumped into him left and right. He messes with his hair awkwardly as he turns in the stool to look for his sister. Tonight was supposed to be a quiet night for the 21 year old, he has over 3 dozen flower arrangements for a wedding to put together. But the again he doesn’t dare fight against his sister, she’s horribly bossy and can get violent when she doesn’t get her way. A sigh escapes his lips as he finishes the drink and walks over to the dance floor, squeezing though the crowd. The bartender was at it again with his magic with the drinks, being charming as always. He finished up ten shots total to be served to a table laden with friends, his co-worker who was the waiter cautiously steering through the dance floor in order not to slip. As Haruki was about to clean the shot glasses, however, his apartment neighbor was there, squeezing through the crowd. Poor feminine-looking dude must be suffering the brunt of being the slave of his sisters once again, but then again, some girls could be feisty as hell, not taking a single no for an answer when it came to getting whatever the hell they want. When another of his co-workers came to return the glasses from another table, Haruki whispered, prompting the waiter to ask the male to come over. And so, that was what the co-worker did. The bartender smirked slightly before resuming the task at hand. Ritsu looks up at the waiter as they came over to them and he nods, slipping though the crowd some. He’s stopped by a young woman who clings to him some, a small wave of panic washes over to him some. Eventually the young man is able to slip from the woman’s grasp as he goes over to the bar. His cloths are all messed up from the woman’s clinging, almost as if he were mugged. He rest his hands tiredly on the bar counter and gives a long sigh before he lifts his head. There was a slight struggle to get into the bar stool due to his short high but he gets up here and gives a long sigh. Haru was done cleaning up three shot glasses when the male finally appeared at the stool close to where he was standing. The waiter gave him a thumbs up even with the slight setback of the clingy woman, right before heading away to his own devices. Haru leaned a bit closer to his neighbor, eyes glinting with interest. "You becoming the slave to those overbearing ladies again, huh? How pitiful," he asked before moving away. Now the bespectacled man was in the mood to fix something on the house for his neighbor. Besides, the girly male was considered an interesting one and he wanted to know him more personally aside from the occasional glances at the apartment as well as the flower shop where the other was working at. Ritsu frowns at the comment and pouts slightly, resting his elbows on the bar. ”I guess it’s a habit with 5 older sisters. Either do what they say or face whatever punishment they decide.” he replies and recalls some of the horrible things his sisters did to him. He shakes his head slightly to push the thoughts out of his head. One thing he didn’t want to do was his sisters to find him, but they have sources the FBI would love to have. He eyes Haruki some as the male mixes the drinks, feeling slightly jealous. The young man was tall, handsome and had a sense of maturity about him. It was something he wished he had instead of his small and slender figure. ”How long have you worked here?” he asked out of curiosity as he watched haruki work, it was obvious he knew what he was doing with his skills. The bartender's chuckle was dry at the commentary about the sisters; such an attitude was why he couldn't stand the female species at times, especially when they had such demeanor for a long time. At the topic change, he hummed in wonder, rolling his eyes a bit while searching for the reply. "Around three to four years now, I think? What matters is that this has become my playing arena," he responded. Though still, he eyed how well Ritsu looked stunning with that outfit of his, more so with his slender body. Ritsu could be mistaken for a female, but Haru knew a bit better than to call him that way. But still, that wouldn't stop him from the possible pining that he was planning to do. With that, he handed to Ritsu a shot of what he just mixed, "Here, and it's on the house. Consider this a new beginning to something interesting, like me considering you as a fascinating specimen." Yep, he was now flirting with him. How suave. OOC: This will be my last post before nap. Ritsu just nods some as he listens to the bartender explaining how long he’s worked at the club for. He just moved into the apartments upstairs not too long ago so he didn’t know his neighbor well. It was interesting to watch him work though. His hands carefully take the shot as he examines it some, unsure of what all is in it. But in the end he just shrugs and downs it, making a slight face at the strength of the alcohol. A small cough escapes his lips, feeling slightly embarrassed at his inexperience with the liquor. ”What so you mean by fascinating specimen?” the young man asked as his cheeked flushed with a bright red color. He wasn’t sure exactly want the bartender meant but it wasn’t hard to tell that he was flirting. That made him feel a little nervous and he couldn’t help but blush slightly as he sat in his chair.”I-I’m a guy you know...” he mutters to himself with a small stutter. Hearing Ritsu cough over the concoction was amusing more so when the other downed it all in just one go. "Careful there, Ritsu. I would have taken it slow if I were you," he commented. Plus, seeing the other blush at the words was just plain cute. "News flash: I'm actually into men more despite the fact I'm bisexual. This nightclub accepts sexuality types of all kinds," He then rested his chin against his hand. "I mean what I said about considering you as an interesting specimen because you are cute, and I wanna hang out with you a bit more, that kind of stuff to get to know you better. Won't force you into something you don't want to do, though. After all, don't you think you deserve a little more reprieve from the bullcrap your siblings had imposed onto you?" His smile then morphed into a smirk. Yep, this will be fun. Ritsu nods some when he was told to take it easy with the drink, he didn’t realize it would be that strong but it left a sweet aftertaste in his mouth. It wasn’t a bad taste in fact he actually really liked it. He adverts his eyes as the other talks about his sexuality, it’s not often he hears things like that. Quickly he perks up as haruki mentions having an interest in him. But soon his expression turns slightly sour when his sisters are mentioned, pouting slightly. ”I don’t mind getting to know you but please don’t mention my sisters” he replies and leans over the bar slightly with a small smile. After a moment or two his head starts to feel a little dizzy from the alcohol. Man, Haru wished that the siblings would stop getting in the way, but what else could the bartender do? He sighed; the alcohol was getting into Ritsu's system a bit faster because of how strong it was. "Very well. Anything that tickles your fancy so that we can start planning on a possible date?" he asked, pouting slightly. After all, finding out what Ritsu would like to do on his day off would be the first step. Anything beyond that... That would have to wait. Sometimes, a party lover needed to comprehend the proper ways of approaching someone. "As much as I want to give you another shot to let you enjoy more of the concoctions tonight, I'm much of a gentleman myself. I should have asked what you preferred first. Oh well, that's what happens when I get a bit too ahead of myself," he rambled on before moving away slightly. Ritsu thinks for a moment about what he likes to do in his free time, there’s a lot he likes to do but it would be boring for haruki. ”Movies, I like to go to the movies and the arcade!” he replies quickly and ruffles his hair some with a small smile. 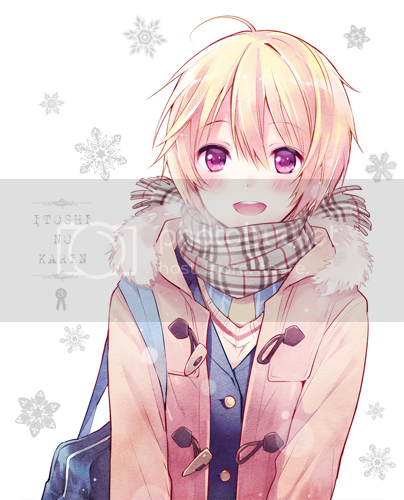 A small laugh escapes his lips as haruki starts to ramble some, finding it cute. The young man was still handsome to Ri, but it was a change of pace to see someone else get ramble. ”Sweets, I like sweet things.” he replies to the rambling and reaches out, carefully grabbing the bartenders shirt. He knows that the other has a job to do but he doesn’t want him to leave just yet. Movies and arcades? That would be a bit too typical, as he wanted something else with a bit more activity going on. He liked being in the nightclub as there would be always be something fascinating going on, even with something people don't see everyday. Haruki's eyes dilated a bit when the shirt was grabbed. "Sweets, huh? Well, will the amusement park suffice? Lots of stuff to do there, like the rides, games and food. Heck, you may find the sweets that you are looking for there," he suggested. But then again, it was a public place, and there was the chance that Ritsu's sisters may come around stalking the two like the paparazzi whenever someone popular was within sight. It would depend on what they would really like to do to show their dominance towards him, much to Ritsu's dismay. Hopefully, such stuff would not happen there. Ritsu thoughts a lot it for a moment and nods quickly when the amusement park is mentioned. He’s been before but really didn’t get to enjoy it before, it would be a first. Carefully he releases his shirt and looks down nervously, carefully fiddling with his fingers some. ”I’d like that.... lot...” he says wit’s a soft voice and looks up at haruki. A soft smile forms on his lips as his heart starts to beat faster. He felt nervous about going on a date, an actual date. He’s been on one when he was younger with a female classmate, it traumatized him. In a way he was thankful to her because he realized he wasn’t really into women. ”When?” he ask, raising his eyes to look at the bartender, looking quite excited. Haru was happy to know that the suggestion was accepted. "My day off will be two days from now, so perhaps we can meet up at the station at the morning?" he asked. At least the date wasn't in some fancy-arse restaurant, so he was free to wear something casual. "Then after the amusement park, what do you want to do next?" he questioned once again, neatly arranging the clean shot glasses into a rack. Who knows if there would be more clients asking for more shots? As if on cue, a male customer came by, asking for four shots of tequila, and Haruki delivered them to him like a pro. Turned out he had a friend along and they shared two glasses each, ready to rant about their work lives in a typical office building.